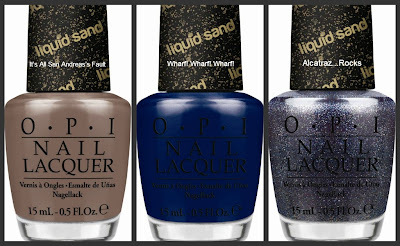 I am so excited to share the news about OPI's Fall/Winter Collection - San Francisco! There are some amazing shades in this collection! San Francisco by OPI brings street chic style with West Coast flair to nails and toes for Fall/Winter 2013. This new collection features a palette ranging from sky and sea-colored hues of blues and gray to reds, burgundies and browns inspired by some of the city’s most iconic elements – Chinatown, the Golden Gate bridge and the Embarcadero. This fall mélange is mixed with texture, seen in three newLiquid Sand™ nail lacquers in earthy hues of taupe, blue and gray: It’s All San Andreas’s Fault, Wharf! Wharf! Wharf! and Alcatraz…Rocks. Liquid Sand lacquers dry to a textured, matte finish, infused with reflective sparkle. For more information, please call 800-341-9999 or visit www.opi.com. Follow OPI on Twitter @OPI_PRODUCT and become a Facebook fan! I know which ones I want! What about you?